Damian “Jr. Gong” Marley invites you to take a journey to Jamaica with him on the 1st Annual Welcome To Jamrock Reggae Cruise. 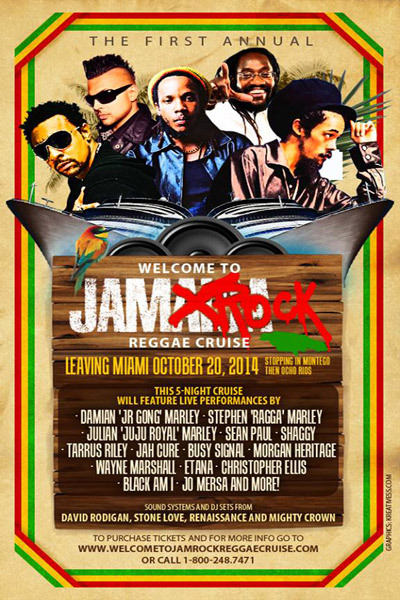 Leaving Miami with stops in Montego Bay and Ocho Rios, this 5 night cruise will be the ultimate Reggae music adventure. Come experience some of the World’s top tier Reggae artists as they will perform in multiple venues throughout the beautiful Norwegian Pearl cruise ship. In addition to the multiple live concerts there will be numerous Sound Systems blazing the vibes all day and all night throughout the cruise.